BUBBLE DOME SHAPE: Unique bubble dome clear umbrella canopy covers your head and shoulders. You can feel the rain drops closer when it is pouring. Keeps you drier from rain and wind than traditional umbrellas. 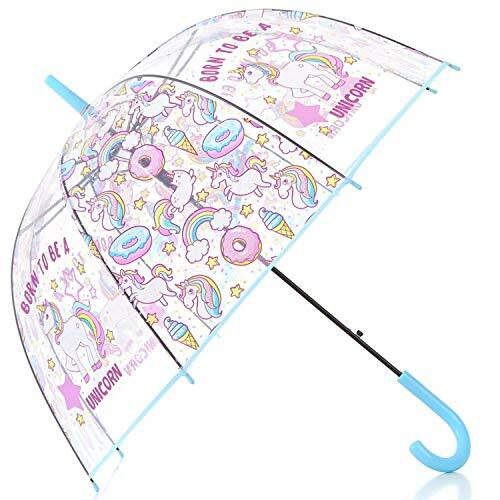 CUTE DESIGNS: Clear Polka Dots Print transparent umbrella canopy, matching color umbrella end, portable hook handle, and its simple designs makes this clear umbrella a ideal gift for kids girls and women. WINDPROOF UMBRELLA CONSTRUCTION: the umbrella is supported by 8 wind resistant fiberglass ribs, make it strong to enough to endure the wind. Measures 34 inches in open diameter and 35 inches long when closed. SAFE MANUAL OPEN: Compared automatic open close umbrellas, manual open umbrella with safe protective button can provide better protection for you and your kids. And it is also more durable as the auto open close umbrellas has limited times of open and close. LIFETIME GUARANTEE - We cannot fight the acts of God, rain included, but we do our best to save our customers from wasted time, hassle or stress! That's why we offer a LIFETIME GUARANTEE. For the first 90 days we offer a full refund if it doesn't meet your expectations, and a replacement warranty for the lifetime of your purchase! NO RETURN NEEDED. SAFE CLEAR DOME UMBRELLA: 52 inches bubble umbrella canopy provides enough coverage for your head and shoulders from rain and wind. It is Safer that you will be able to see where you are going. 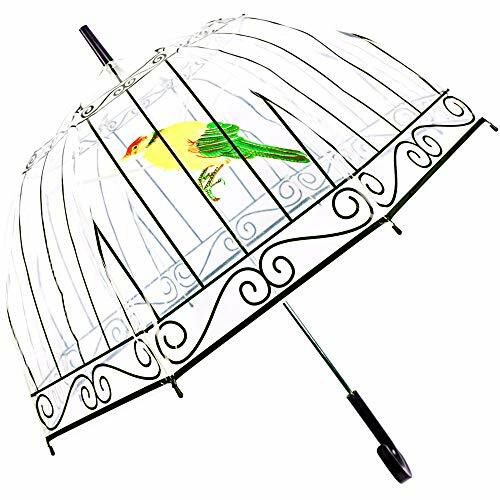 CUTE BIRDCAGE DETAILS: cute transparent birdcage printed umbrella canopy, black lightweight plastic hook handle, transparent pinching proof umbrella open close button, make it a great accessories for outdoor event or photography. WINDPROOFUMBRELLA FRAME: this umbrella is made of 8 white 3.0 mm fiberglass ribs (compared to 2.6-2.8 mm) , 8 Fiberglass Support Ribs and 10 mm central pole (Compared to 8 mm metal central pole) --Ultra light and strong, making it wind resistant, Beautiful & Easy to carry. EASY SAFE TO USE: umbrella opens and closes with a protective pinch proofing button, providing protection for your kids and fingers. SAFE CLEAR BUBBLE UMBRELLA: large 52 inches see through bubble umbrella canopy provides enough coverage for your head and shoulders from rain and wind. You are able to see where you are going. 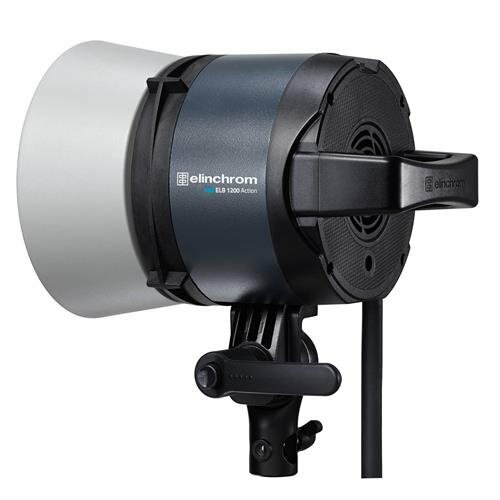 It is a ideal accessories for weddings photography. ELEGANT DESIGN DETAILS: pure white leather hook handle, clear rain-drop tips and protective steel ends, make it a great accessories for outdoor weddings or photography. 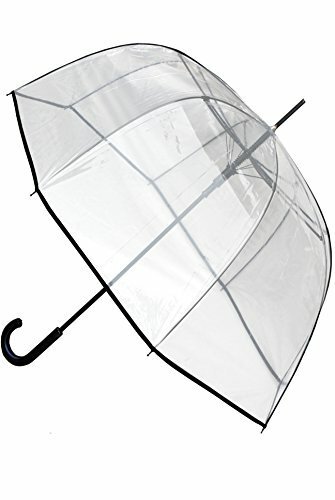 SUPERIOR WINDPROOF: this umbrella is made of 8 premium white 3.0 mm fiberglass ribs (compared to 2.6-2.8 mm) , 8 Stainless Steel Support Ribs and 14 mm Aluminum central pole (Compared to 10-12 mm metal central pole) --Ultra light and strong, making it super wind resistant, Beautiful & Easy to carry. EASY SAFE TO USE: umbrella opens and closes with a protective pinch proofing button, providing protection for your kids and fingers. Safety Reflective umbrella straps on the canopy can be easily seen by car drivers to keep you safe at day or night. SAFE CLEAR BUBBLE UMBRELLA: large 52 inches see through bubble umbrella canopy provides enough coverage for your head and shoulders from rain and wind. You are able to see where you are going. AUTO OPEN, LIGHTWEIGHT AND PORTABLE: Automatic Open functionality ensures that there will be no delay to your comfort. Fast and reliable automatic opening function. Simply press the button on the shaft to open. 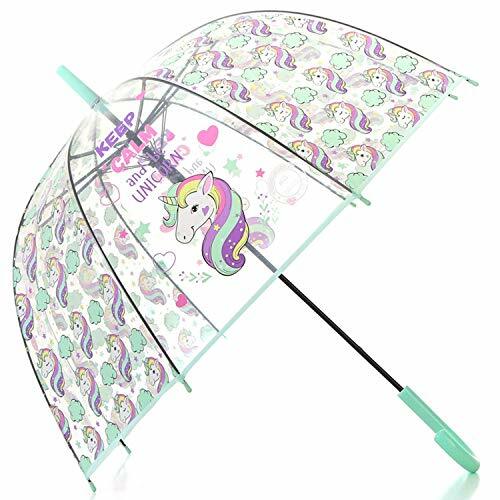 CUTE DESIGNS: transparent umbrella canopy with prints, matching color umbrella end, portable hook handle, and its simple designs makes this clear umbrella a ideal gift for kids boys girls and women. WINDPROOF UMBRELLA CONSTRUCTION: the umbrella is supported by 8 wind resistant fiberglass ribs, make it strong to enough to endure the wind and perfect for outdoor weddings and events. Measures 32 inches in open diameter and 32 inches long when closed. 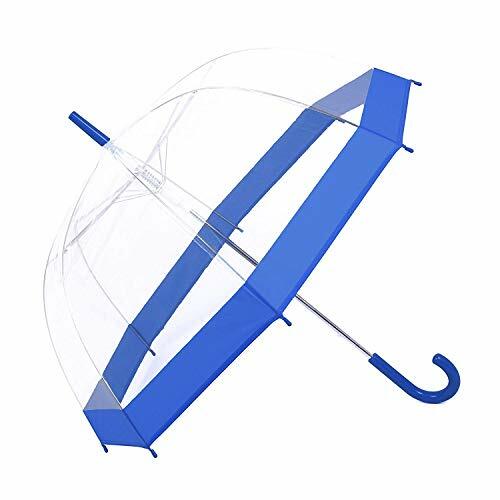 CUTE DESIGNS: Blue transparent umbrella canopy, matching color umbrella end, portable hook handle, and its simple designs makes this clear umbrella a ideal gift for kids boys girls and women. WINDPROOF UMBRELLA CONSTRUCTION: the umbrella is supported by 8 wind resistant fiberglass ribs, make it strong to enough to endure the wind. Measures 32 inches in open diameter and 32 inches long when closed. 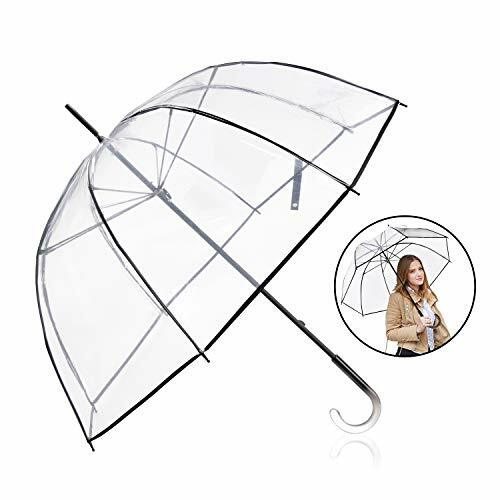 SAFE CLEAR BUBBLE UMBRELLA: 47 inches see through bubble umbrella canopy provides enough protection for your head and shoulders from rain and wind. You are able to see where you are going when it is raining. It is an ideal gift for your girls. CUTE DESIGN DETAILS: pure white leather hook handle, light aluminum central pole, colorful eiffel tower high heel prints & safe round umbrella tips, make it a great accessories for outdoor events or weddings photography. SUPERIOR WINDPROOF: the umbrella is made of premium white 3.0mm fiberglass ribs (compared to 2.6-2.8mm), 4.0mm fiberglass support ribs and 10mm Aluminum central pole(compared to 6-10mm metal central pole)--Ultra light, strong and anti rust, making it super wind resistant, Beautiful and Easy to carry. EASY SAFE TO USE: umbrella opens with a protective pinch proofing button, providing protection for your kids and fingers. Safety round tips and protective matching color trim, make it safer and cute to use and more durable. 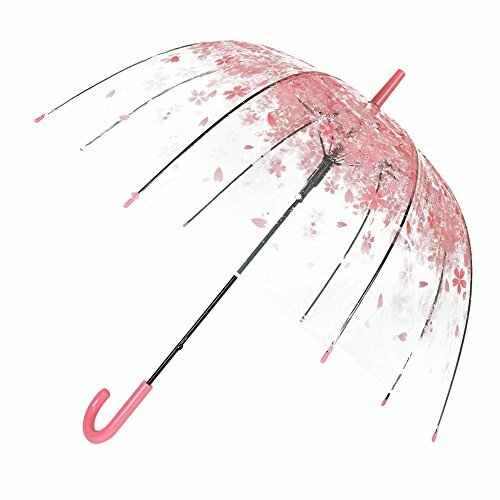 【FASHIONABLE FOR SPECIAL OCCASSION】This clear umbrella will easily compliment your wardrobe choices and matches your outfits. 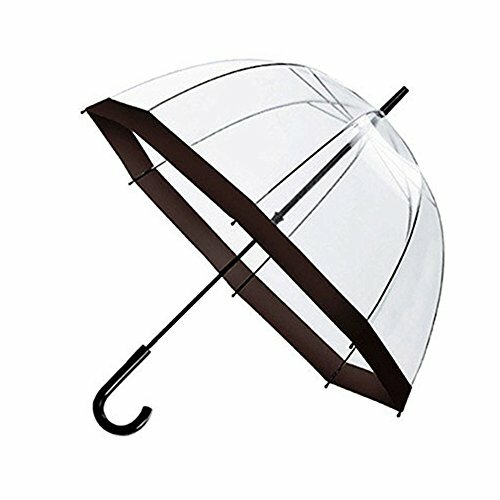 Clean & unique 16 Ribs clear umbrella is the perfect rain umbrella for weddings, graduation, prom, or everyday city walking. 【STURDY & WINDPROOF】 This see through clear umbrella is upgraded with strong 16 fibreglass ribS, Strong enough to withstand heavy downpours and powerful gusts of wind, this plastic clear umbrella is a perfect urban companion. 【AUTO OPEN EASY OPERATION】 Easy auto open feature means canopy opens at a press of a button which allows for easy one-handed operation. Very convenient to use. 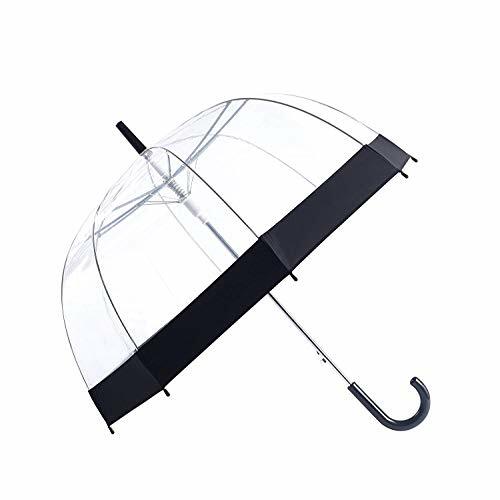 【LARGE CLEAR COVERAGE】With 48'' arc canopy and 40.5'' open diameter, you'll be protected from the wind and the rain so hair and clothes stay dry. Navigate busy commuter streets with the clear view canopy, which allows you to see where you're going while staying dry. You Never get soggy and wet again with this strong and reliable umbrella. 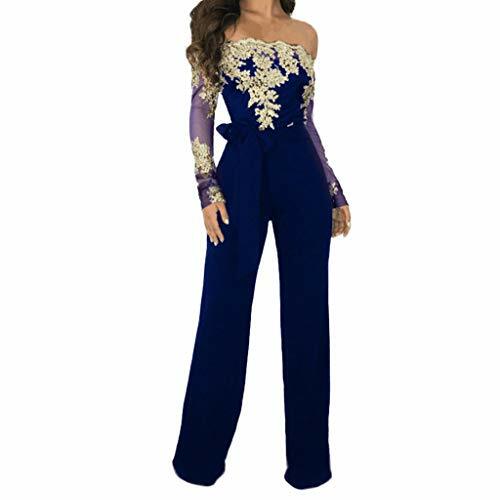 Great Birthday Thanksgiving Christmas gifts for girls and women. 【LIFETIME GUARANTEE】 We cannot fight the acts of God, rain included, but we do our best to save our customers from wasted time, hassle or stress! That's why we offer a LIFETIME GUARANTEE. For the first 90 days we offer a full refund if it doesn't meet your expectations, and a replacement warranty for the lifetime of your purchase! NO RETURN NEEDED. 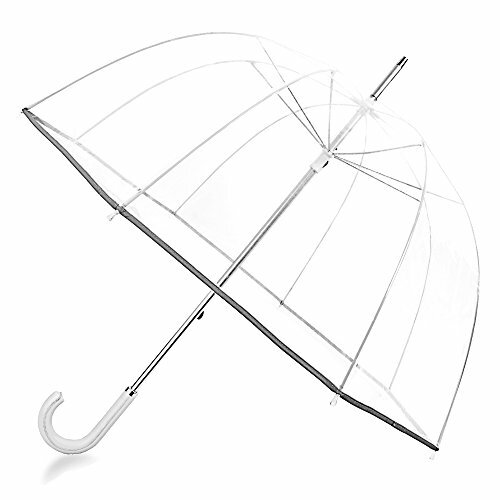 THE BEST FULL-LENGTH CLASSIC UMBRELLA: Top rated and highly acclaimed. 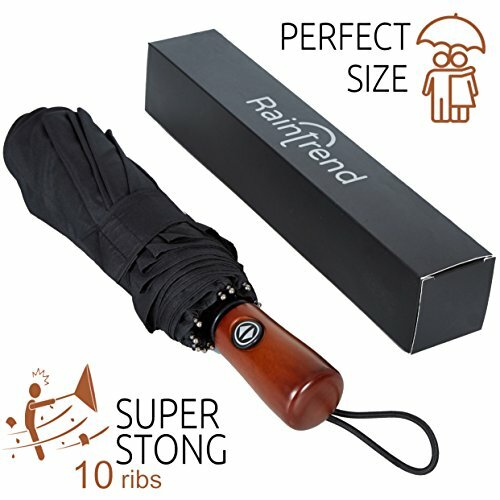 Unparalleled strength, built to last considerably longer than your standard umbrella. Our modern take on the classic cane umbrella. STRONG, WIND-RESISTANT FRAME: Patented wind-combat frame system features a flexible wind-tension canopy which resists inversion in strong winds. The shaft is made of high-grade fiberglass for enhanced stability. FOR EVERYDAY AND FORMAL USE: The Davek cane umbrella is a handsome model designed with a beautiful "waterfall" dome-shaped canopy and complete with a soft, genuine top-grain leather handle, elegantly stitched. UNCONDITIONAL LIFETIME GUARANTEE: Every Davek umbrella is covered under our famous Unconditional Lifetime Guarantee: If your umbrella should fail to function properly at any time for any reason whatsoever, we will gladly replace it for free (excluding shipping). Forever. 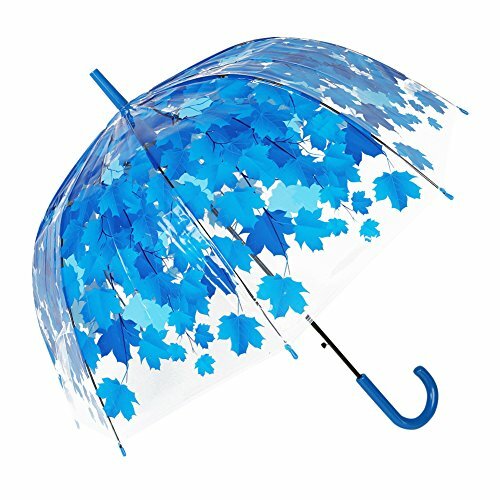 LOSS PROTECTION: If you lose your umbrella, you can use a unique serial number to redeem a replacement umbrella at up to 50% off the regular retail price. One loss redemption per order. DIMENSIONS: Closed length: 35 in. Arc diameter: 50 in. ; Spacious coverage diameter: 44 in. ; Weight: 1 lb 9 oz; Automatic open system. 【FIBERGRASS RIBS FOR DURABILITY】 This bubble umbrella is new improvement, new improved fibreglass frame and ribs for added strength and durability, it is durable to protect you from bad weather, this is bound to become your favorite umbrella. 【AUTO OPEN EASY OPERATION】 Easy auto open feature means canopy opens at a press of a button which allows for easy one-handed operation, very convenient. 【TRANSPARENT DOME COVERAGE】 Made of transparent clear water-proof POE fabric, it allows you to see through perfectly even in rainy days. You can feel the rain drops much closer and it goes with any of your outfit. Great Birthday Thanksgiving Christmas gifts. Also this special design clear umbrella is good for wedding occasion. 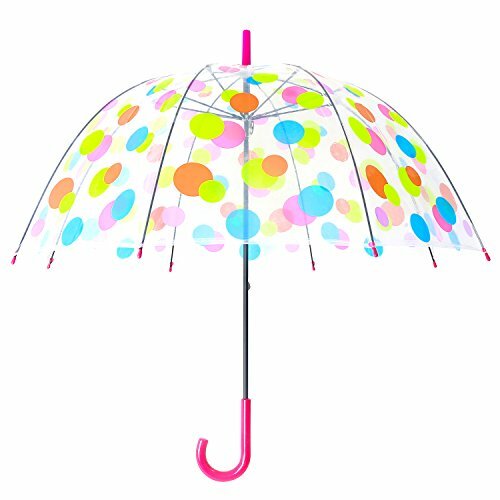 【FASHIONABLE & COMFORTABLE】 Cute Bubble Dome Shape with color trim will cheer you up, very nice umbrella to make you eye-catcher in the rain! And the J hook handle provides you with a good grip for those windy rainy days. 【MILD RAINPROOF & WINDPROOF】 This bubble umbrella open diameter 32.68 " /83cm, arc 44.88 " /114cm, big enough to keep the rain off which can provide you excellent protection from moderate rain or wind. 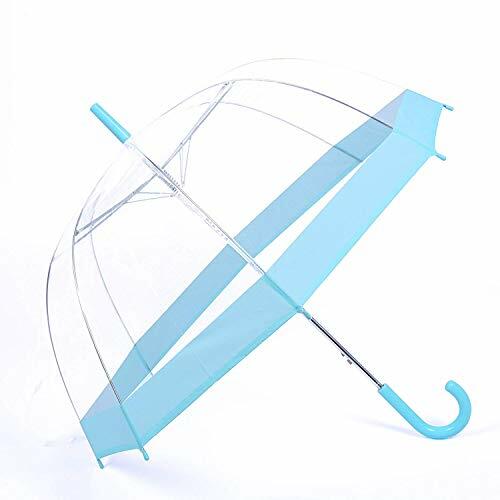 【WELL MADE & SUPER STURDY】The clear umbrella itself seems to be well made and is very sturdy. The ribs are good quality and are working well. The handle is a well secured plastic "j" shape. The whole thing is very light, so much so that your toddler can carry it around with no problems. 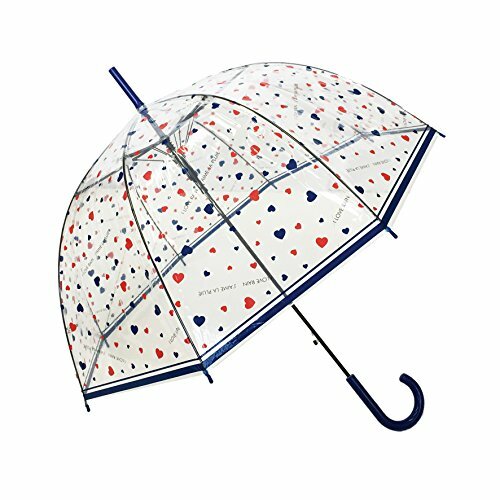 【KEEPS THE RAIN AT BAY】It definitely keeps the rain at bay. When the rainy season is coming, it rains day after day and you can have put this bubble umbrella to good use. You will really like that you can walk in the rain with your head held high, looking through the clear plastic instead of hunkering down and using an umbrella like a shield. 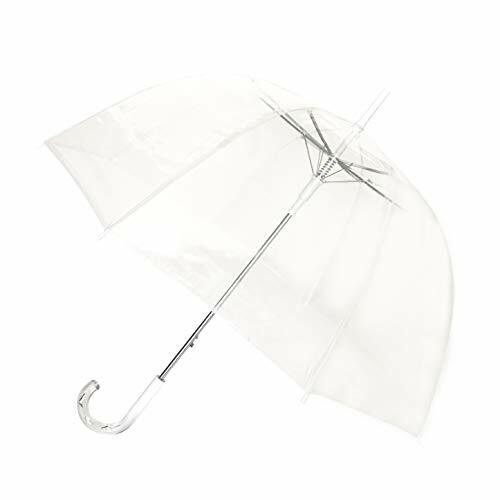 【UNIQUE APPEARANCE】A traditional clear umbrella, that has a unique appearance that defies the classic umbrella look. Offering a deep dome for a canopy, this model has unique rain protection. 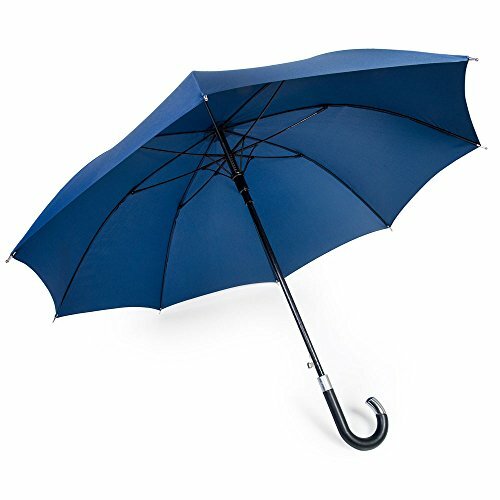 The handle and metal shaft give this umbrella plenty of support and offer a sturdy rigidity that some of its competitors simply lacked. In terms of wind resistance, this product will never flipped inside out. 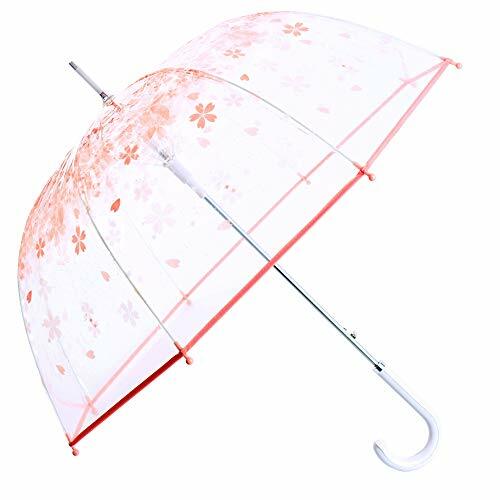 【WATER PROOF & GREAT AT WATER CONTROL】The plastic material of the umbrella dome is super sturdy and very water proof! The seem where the clear material meets the color block is strong. The material, while being trendy, is also a great at water control! 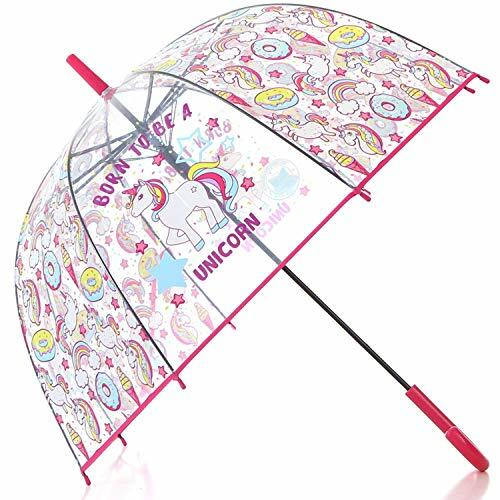 It helps the water drip smoothly from the umbrella and dries faster once you are inside! All in all, you will happy to have this umbrella! It will be a life saver when you have to trek to class or work in the pouring rain! Fiberglass Ribs for Durability:The umbrella is supported by 8 wind resistant fiberglass umbrella ribs, make it strong enough to endure the wind and perfect for outdoor weddings and events. Auto Open Easy Operation:Easy auto open feature means canopy opens at a press of a button.Automatic Open functionality ensures that there will be no delay to your comfort. Transparent Bubble Dome Shape:Keep an Eye on Your Surroundings While Protecting Yourself and Kids from Rain and Gusting Wind.Feel the rain drops much closer and it goes with any of your outfit. 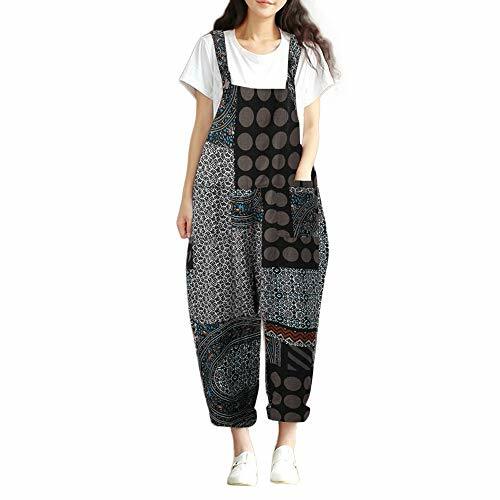 Fashionable and Comfortable:Cute Bubble Dome Shape with color trim will cheer you up! And plastic J-handle makes it comfortable to hold. Windproof Umbrella Construction:This bubble umbrella open diameter 32.68 ",arc 44.88 ",big enough to provide you excellent protection from the rain or wind. FIBERGLASS RIBS FOR DURABILITY: The umbrella is supported by 8 wind resistant fiberglass umbrella ribs, make it strong enough to endure the wind and perfect for outdoor weddings and events. AUTO OPEN EASY OPERATION: :Easy auto open feature means canopy opens at a press of a button. Automatic Open functionality allows for easy one-handed operation which is safe and convenient for you and your kids to open and close. TRANSPARENT BUBBLE DOME SHAPE: Transparent design allows you to keep an eye on your surroundings while protecting yourself and kids from rain, gusting and wind.Feel the rain drops much closer and it goes with any of your outfit. RAINPROOF & WINDPROOF：This bubble umbrella open diameter 31.8 ",arc 47.2 " and adopted high quality POE materials, which is big and solid enough to provide you excellent protection from the rain or wind. 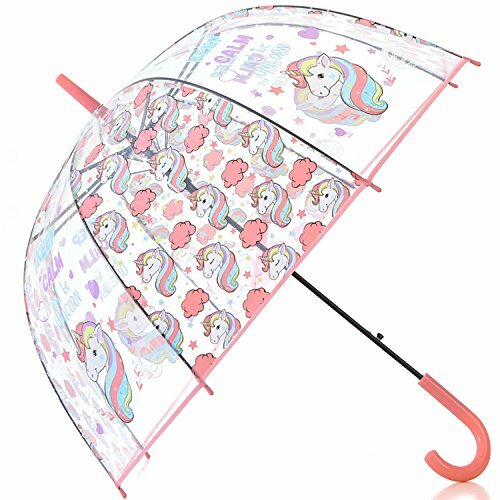 FASHIONABLE & COMFORTABLE: Cute Bubble Dome Shape with colorful unicorns will cheer you up. And plastic J-handle makes it comfortable to hold. Kids will enjoy a good time in a rainy day. It's a ideal gift for children. 【SMOONTH EASY OPEN & CLOSE】 Features manual open Function, just press the button and push it up, it is very easy to open the umbrella when you get out from your car in the rains. Scratch-free ball protects umbrella spokes for safe operation, easy to open & close without using too much strength. 【QUALITY CLEAR DOME UMBRELLA】 Made of quality transparent clear water-proof POE fabric, better than the general transparent umbrella, wear resistance, strong folding strength, transparency is also higher. It allows you to see through perfectly even in rainy days. You can feel the rain drops much closer and features black trim that will perfectly match any of your outfit. Also this special design black clear umbrella is good for wedding occasion. 【MILD RAINPROOF & WINDPROOF】 This bubble umbrella open diameter 37" /94cm, canopy size 51.6 " /131cm, big enough to keep the rain off which can provide you and your family excellent protection from moderate rain or wind. New improved stainless steel frame and ribs for added strength and durability, better gloss, more windproof and stronger, it is durable to protect you from bad weather. 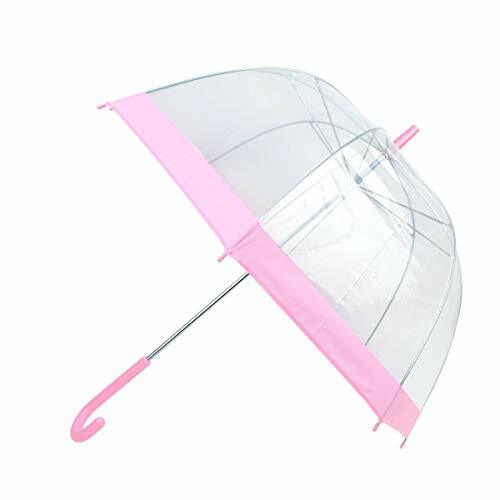 【STYLISH DESIGN WITH EaASY-GRIP CURVED HANDLE】Cute Fashion Transparent Bubble Dome Shape with color trim will cheer you up, stylish design very nice umbrella to make you eye-catcher in the rain! Clear protection lets your style shine through. Exquisite design, fresh and lovely, a perfect gift for women. And the J hook handle provides you with a good grip for those windy rainy days, avoid hand and wrist fatigue. 【100% SATISFACTION GUARANTEE】 Every Rainbrace clear umbrella provided with 1 year warranty since the date of purchase, please feel free to purchase. Rainbrace devotes to providing 100% after-sale services for all customer. Please contact us if you have any problems and we will provide refund or replacement within one year. 【AUTO OPEN & SAFETY CLOSE】 Pop up umbrella means canopy opens at a press of a button which allows for easy one-handed operation, very convenient. 【SHAPE & SIZE】Dome umbrella is rainproof and windproof! Open diameter 32.68" / 83cm, arc 44.88" / 114cm, big enough to keep the rain off which can provide you excellent protection from moderate rain or wind. 【J-SHAPED HANDLE】J-hook handle provides you with a good grip for those windy rainy days. This golf umbrella is comfortable and lightweight to hold, convenient to hang up when folded. 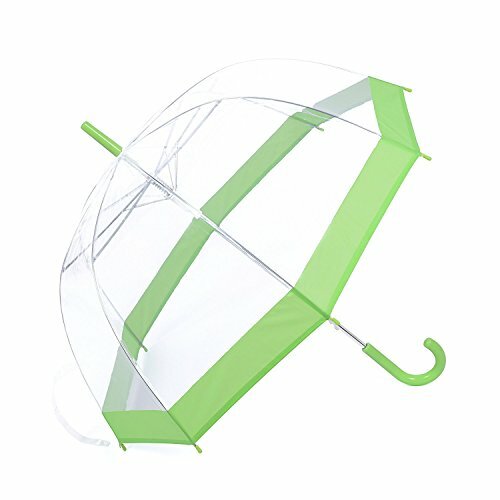 【COLOR: TRANSPARENT】Transparent umbrella allows you to see in all directions goes with any of your outfit. Black polyester edge better reveals your nobility. Put on your favorite clothes and enjoy the beautiful scenery along the way when travelling. Additional, it is great Birthday Thanksgiving Christmas gifts. Also this special design clear umbrella is good for wedding occasion. 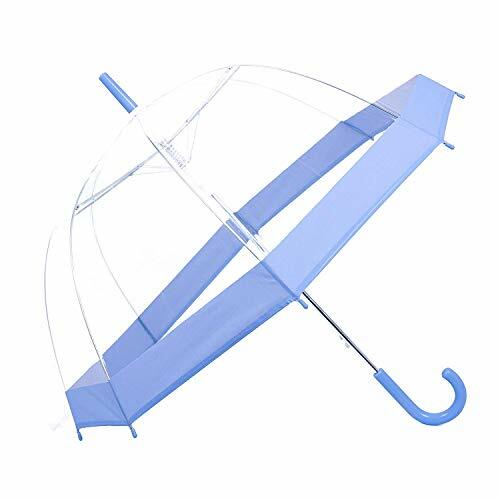 【PREVENT FROM FLIPPING】Sturdy aluminum alloy central rob and durable fiberglass ribs can perfectly prevent the bubble umbrella from flipping inside out, keeping you nicely shielded from the rain. 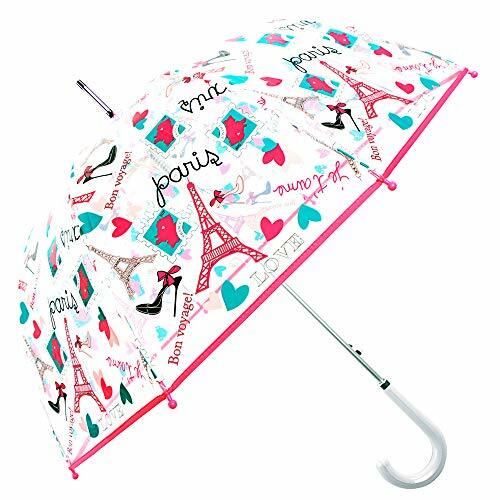 Be an eye-catcher with this elegant portable umbrella to enjoy your rainy days! 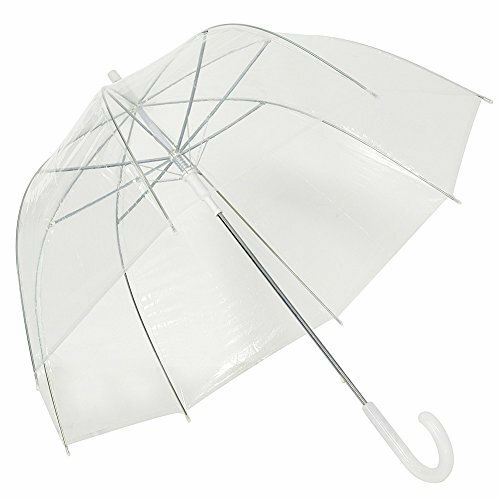 CLEAR UMBRELLA FOR MEN WOMEN: Our Lightweight Design unisex see-through umbrella is perfect for anyone who loves the stylish design of a clear dome shaped umbrella. It helps you see where you are going in busy intersections while staying dry. It also adds some style and flair to any wardrobe. Transparent. 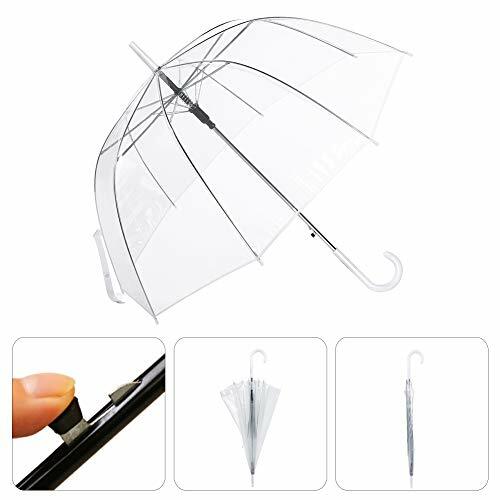 DOME SHAPE: Windproof clear dome umbrella for adults. Can be used for both men and women. Dome comes with a colored border and handle in great colors: black, white, red, and fuchsia. SLIM HANDLE: Non-slip handle with automatic open button for ease of use. Easy to open and close without using too much time or effort. FULL SIZE UMBRELLA: Approximately: 40" diameter x 35" tall. Can be used for casual use, golf, weddings, celebrations, winter, and most other outside events. Excellent Quality and Customer Service: We are here to help! Feel free to contact us with any questions you may have. We will always answer in one business day. Ask about bulk orders! TRANSPARENT CANOPY - The clear bubble dome design measures roughly 30" wide x 31.5" tall. Let the semi-automatic gliding design open and close your umbrella with ease. 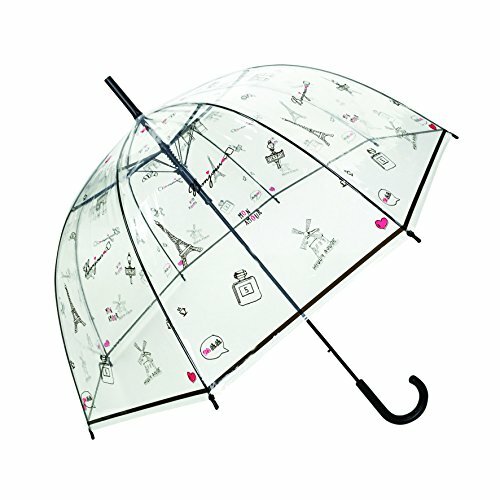 PERFECT HOLIDAY GIFT - This umbrella is perfect for gift for her (or him!) for birthdays, holidays, anniversaries and more! WINDPROOF DESIGN - The bubble dome design allows for the most coverage and protection from even the worst downpours. MAKE IT RAIN MEN - Who isn't going to love this on their rainy day? Cheer up people passing by or give yourself a laugh while you stay dry! At MAAD BRANDS, we so sure of the quality of our products, we offer a "No Questions Asked" 100% Satisfaction Guarantee. If you aren't happy for any reason, we will immediately give you a refund. 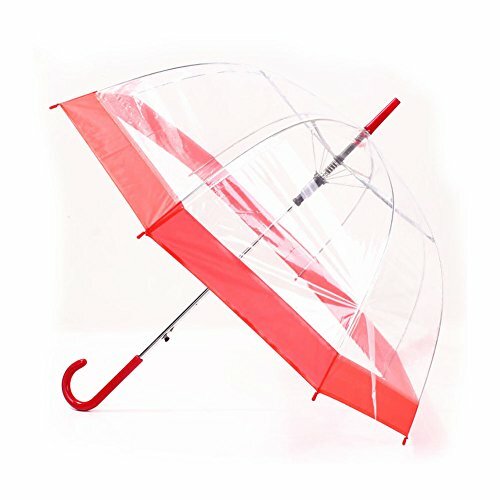 √Clear bubble canopy -- Keeps you drier from rain and wind than traditional umbrellas. Made of transparent clear water-proof POE fabric, it allows you to see through perfectly even in rainy days. You can feel the rain drops much closer. Easily navigate busy city streets with it that won't obstruct your vision or bump into people passing stands behind our umbrellas. 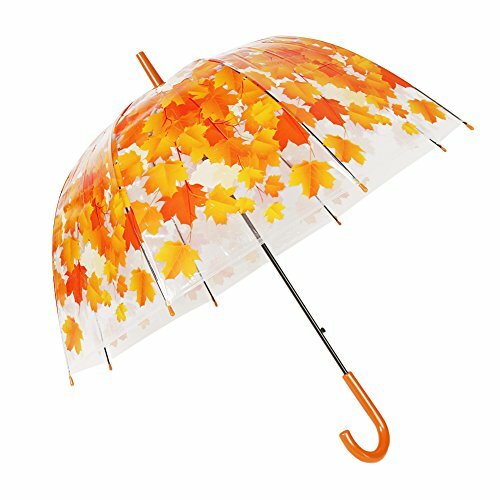 √Mild Rainproof & Windproof --Umbrella tail with lightning protection design, product safety in the rain. the umbrella is supported by 8 wind resistant fiberglass umbrella ribs, make it strong to enough to endure the wind. that keep you protected while you walk. Clear-view canopies come with trendy prints and colorful patterns it is durable to protect you from bad weather. √Convenient and Comfortable --Fast auto open feature means canopy opens at a press of a button which allows for easy One Second One Hand Operation. features a top-of-the-line clear acrylic handle for your most comfortable. Matching Color Hook Umbrella Handle and End. will cheer you up in any dismal weather. 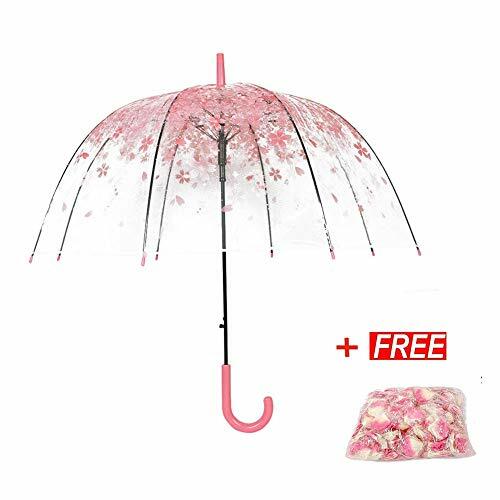 √Fashionable & Multiple Uses--This special design dome bubble shape umbrella is perfect for outdoor weddings and events. 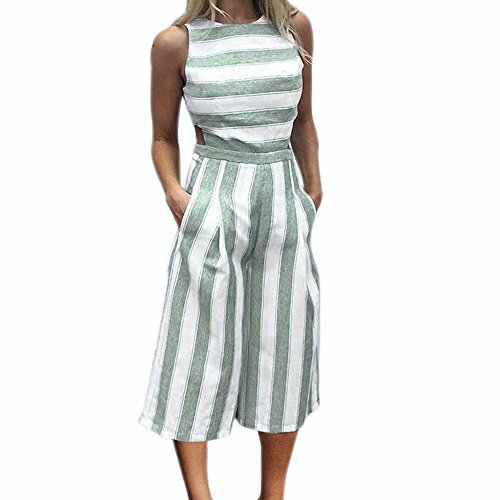 Be an eye-catcher when attending party, gathering or camping. bathed in the sun, travel, go to the park Ornamental flowers, Photography props, keep it you will lets your own personal style shine through. √We Guarentee That Each And Every Review On This Listing Was Left Honestly. Other Sellers May Have Given Away Products In Exchange For Their Positive Reviews. Our bubble umbrella as We Continue To Improve. We do encourage customers to always leave product reviews. 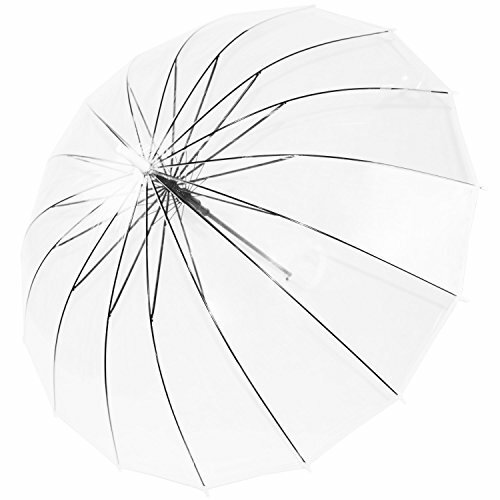 we have used customer reviews to improve our clear bubble dome umbrella. We have always been committed to our customers and we will continue to be in the future. 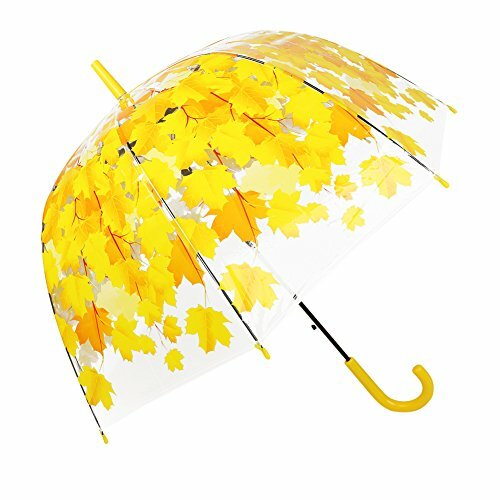 ☔【Best Gift】Distinct transparent design is the perfect rain accessory for a wedding, graduation, prom, or everyday city walking. 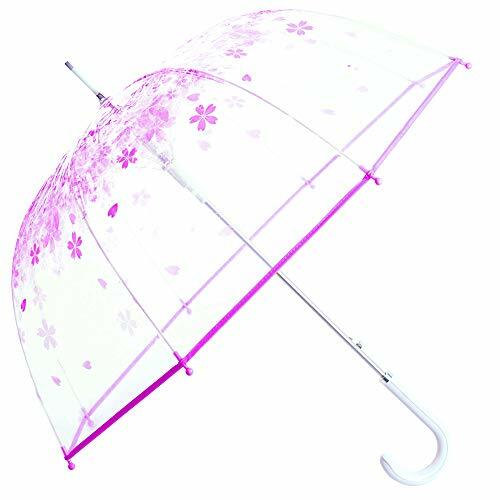 Its cute simple designs makes this clear bubble dome umbrella a ideal gift for girlfriend or child. Measures 34 inches (85cm) long and 34 inches (85cm) in diameter when open. If anything goes wrong with your umbrella,Just Return it, And we'll refund it with Amazons Return Policy. YEARS OF RESEARCH AND DEVELOPMENT - After years of designing and testing brollies, we understand what makes a great umbrella; we've done the research so you don't have to. This umbrella breaks all the rules! 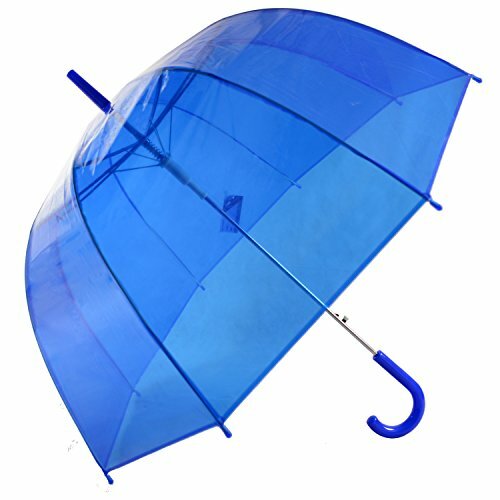 A STRONG FIBER GLASS FRAME - Our unique umbrellas are STRONG as we only use superior components and highly skilled Technicians. Our UltraFlex Frame Technology gives you both STRENGTH and FLEXIBILITY. Even if gusts reach 50mph+, we use a generous amount of fiber glass giving you the confidence that the umbrella is strong. Each rib and stretcher are highly engineered to give you RELIABILITY. A STRONG CANOPY THAT'S BIG ENOUGH TO COVER YOU - We only use HIGH QUALITY, WATERPROOF FABRICS that are strong, lightweight and flexible so they work in harmony with the frame. When open, the canopy has a generous 51in arc with a 33in diameter, a generous depth to protect both head and shoulders from the elements. SUPERB FINISHING TOUCHES - This umbrella has a subtle 0.5in black trim around the base of the canopy. This trim is thinner when compared to many other umbrellas to assist with visibility at the important eye level. It also has a comfortable and stylish hook handle. EXCEPTIONAL CUSTOMER SERVICE - Buy with confidence with our money-back guarantee. Our after-sales support is world-class, no matter how long you've had the umbrella, always get in touch if you need us and we'll do our best to help. We never take your custom for granted; we have many loyal customers who come back to us again and again as we look after them! Measures 34 inches (86cm) long and 33 inches (85cm) in diameter when open. 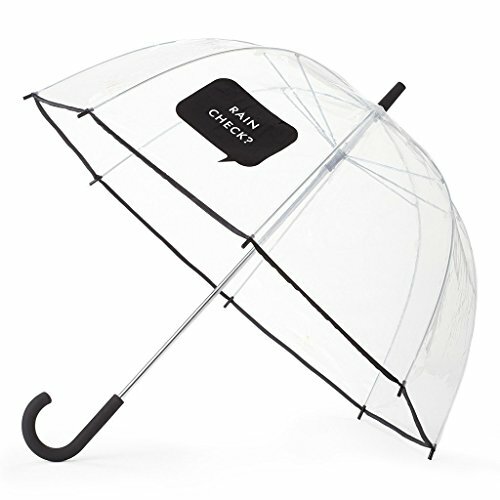 Clear design with black block print saying, "rain check?" √Convenient and Comfortable --Fast auto open feature means canopy opens at a press of a button which allows for easy One Second One Hand Operation. features a top-of-the-line clear acrylic handle for your most comfortable. will cheer you up in any dismal weather. √Mild Rainproof & Windproof -- the clear golf umbrella is supported by 8 Aluminum alloy umbrella ribs, make it strong to enough to endure the wind. Measures 32 inches (82cm) long and 32 inches (82cm) in diameter when open. big enough to keep the rain off which can provide you excellent protection from moderate rain or wind. 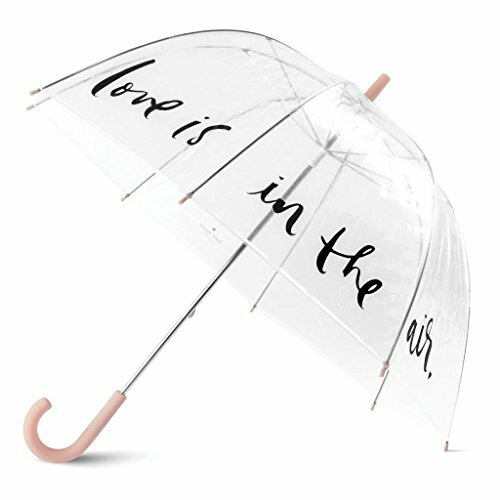 Clear design with black script saying, "love is in the air"
1.5.This bubble umbrella open diameter 32.68 " /83cm, arc 44.88 " /114cm, big enough to keep the rain off which can provide you excellent protection from moderate rain or wind. 2.Easy auto open feature means canopy opens at a press of a button which allows for easy one-handed operation, very convenient. 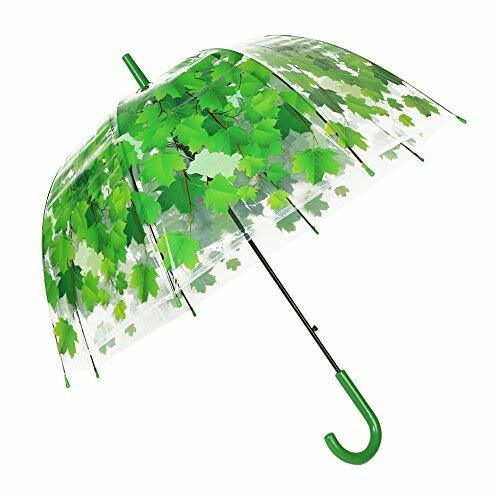 3. new improved fibreglass frame and ribs for added strength and durability, it is durable to protect you from bad weather, this is bound to become your favorite umbrella. 4. Made of transparent clear water-proof POE fabric, it allows you to see through perfectly even in rainy days. You can feel the rain drops much closer and it goes with any of your outfit. 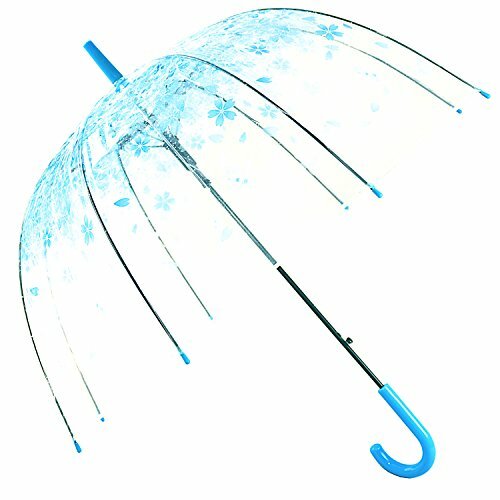 Also this special design clear umbrella is good for wedding occasion Christmas Thanksgiving Holiday. 5. 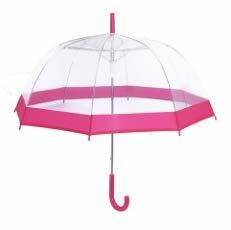 Cute Bubble Dome Shape with color trim will cheer you up, very nice umbrella to make you eye-catcher in the rain! And the J hook handle provides you with a good grip for those windy rainy days. COLLAPSIBLE UMBRELLA Windproof is well-designed and elegant. Ergonomic wooden handle is of classic style. Size of the golf Umbrella man is perfect to cover up to 2 people to protect from rain! TRAVEL UMBRELLA is lightweight and handy! Umbrella Travel fits perfectly in your briefcase, backpack and glove compartment. Portable Umbrella folding is ideal for work and traveling. You can easily take your Folding umbrella with you everywhere you go! OVERSIZED UMBRELLA BLACK is the best gift idea. The Rain Umbrella is delivered in a gift box, ready to go. 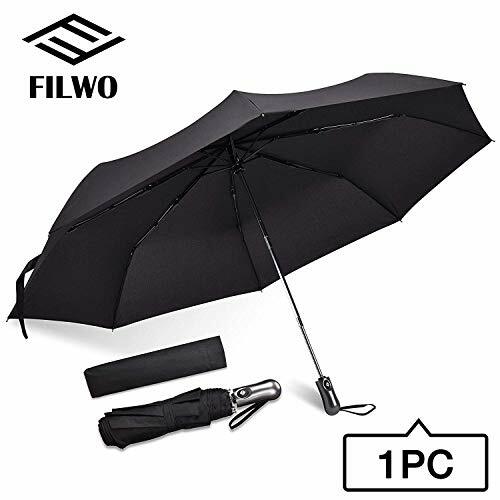 Elegant black umbrella will become the best gift to every man! 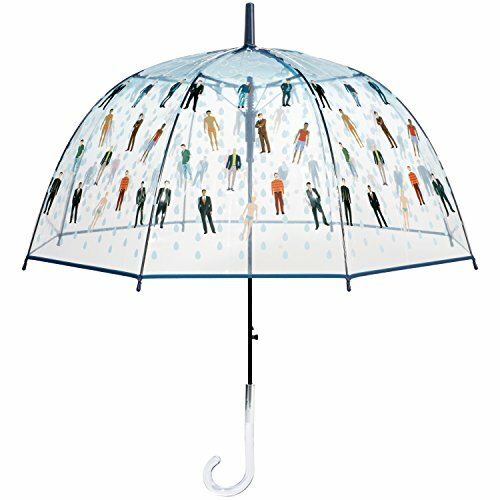 MEN UMBRELLA COMPACT - a LIFETIME replacement warranty policy is what you get with this purchase guaranteed! 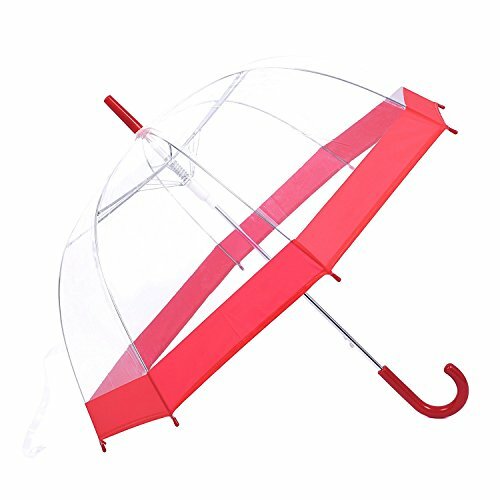 Clear Umbrella, Bubble Dome Transparent Umbrella for Weddings Windproof (Red) 1.